This was the first year for the First State Comic Con, and I wanted to wear something new. After last Halloween’s Batgirl project, I decided to start reading monthly comics and opened a box with the local shop. 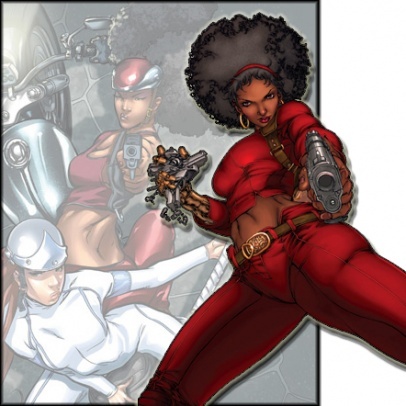 My first subscription was Fearless Defenders, starring Misty Knight. Within the first three pages, I knew I needed her in my closet. That sounds creepy, but it’s true. The easiest format is a list of pieces, so with my acquisition and construction notes, here we go. Wig – Hair and beauty supply store – I picked up a super curly wig since they didn’t carry an epic ‘natural hair’ wig. I’m going to replace this with a shorter afro puff as soon as possible. The curls are nice, but heavy, and they don’t do the character justice. Red headband – Scrap fabric – Cut a strip, serged the edge, turned, stitched down the edges – voila! Brown leather belt w/ gold buckle – pleather remants, interfacing, hair clip – I pieced together the belt with strips and applied fusible interfacing. The buckle was a wood-painted plastic hair clip. I removed the clip piece and spray painted the rest gold. I added magnetic purse closures to the belt and attached the buckle with gold paper fasteners. If I come across a lightweight oval buckle (or hair clip), I’ll replace this. Black undershirt with ‘bionic arm’ – Black and gold spandex – Long story short: My original arm design involved Wonderflex and evolved into embroidery. It may be hard to believe, but I had a full month to work on this costume. At this moment, there is a half-constructed “Satan Claw 2.0” made of posterboard, craft foam, and masking tape in my workroom. I realized at some point that I needed to be realistic about how the piece was going to fit on my arm, so I set out to make a compression sleeve to which I could attach the 3D parts. Then, I realized I wouldn’t have time to make the whole arm 3D, so I started researching applique and quilting techniques so that I could still have depth on the upper arm to match the gauntlet on the lower arm. Then, I realized that the gold materials in the top and bottom halves wouldn’t match, so I decided to look into painting fabric to look like a robotic arm. Days before the con, I dropped the craft foam and resorted to marker on spandex–not even good marker, washable kids markers because I was desperate. The marker idea was neat, but not pretty and certainly 1D, so I tried stitching over the shoulder lines with embroidery thread. [At that point, I’d also decided to pull Zelda out of the closet as my back up costume because I hadn’t even started the rest of this outfit.] Within 24 hours, I had stitched lines down the entire arm. It involved ripping stitches to do the fingers as well, but I was delirious and well past caring. I love the way the arm turned out, but I’m going to redo it in two layers with a wider stitch to clean it up. In the one picture that I have, you can’t see the stitching at all. The undershirt and sleeve were patterned off of an old cheerleading high-neck midriff top, which is the only true spandex item in my house. [Pfft…and Husband asked why I hang on to all my old stuff.] I lowered the neckline and used 1/4 inch elastic at the bottom. For the glove, I traced my hand onto a doubled piece of fabric, pinned it, stitched the outline, trimmed the edges, and turned it. For the redux, I’m going to cut the whole arm so that the seam is on the inside up through the thumb. Red crop top – Red spandex – The current version of Ms. Knight exposes a prudent section of the midriff in a well fitted top that has a lovely open collar. I have never worked with spandex, and I’ve never draped–my duct tape dressform was invaluable in this process. I used painter’s tape to outline the cut of the top, then I used leftover black spandex as a muslin. The mock-up collar was made of interfacing, since I knew it didn’t need to stretch. I darted the bustline to match her seams and marked for an invisible zipper down the front. I knew that the hem was going to need to be interfaced, but I had no idea how to accomplish that. Unfortunately, I cut the top too short, so I used the facing I had already interfaced as a guard along the bottom, instead of turning it under. I’m going to redo the top, so I’ll cut that as one piece on the next one. The collar was close to what I wanted, but it doesn’t stand up as much as I’d hoped, so I’ll need to fix that as well. On the upside, I felt well-covered. Red pants – Red spandex – I used a pair of my bootcut yoga pants as a starting point to pattern these pants. Once I knew the posterior was fitted, I slimmed the legs, added an elastic waistband, and attached some belt loops made from the scraps. Second easiest pair of pants ever. In order to keep the legs from bunching, I need to make them into stirrups. Knee pads – Pleather remnants, red spandex – The pads are brown broadcloth and brown pleather around quilt batting. I sewed that down to spandex scraps, serged up the back, and hemmed the top and bottom with a zigzag stitch. These move around and up and down the leg, so I’m going to stitch them to the pants at the top. Red boots – Ill-fitting shoes, red spandex – Holy crap, I can’t make shoe/boot covers. It was 2AM the night before the con, and I was still considering ditching the project for Zelda. I had a pair of shoes that were a size too small, so I cut out enough of the bridge to be able to slip my feet in. I made a tube of spandex that would fit over the shoe and up to my knee. I cut a slit in the tube along the sole of the shoe, then pulled out the hot glue gun. With my foot in the shoe (caution had been thrown to the wind ages ago), I lifted the spandex and glued along the lowest edge of the shoe in small sections. I patted the spandex back down over the glue, with fewer burns than expected. After letting the glue cool and harden, I took off the “boots” and used a razor to trim the excess fabric along the sole. The metal bits at the back of the ankle are folded metallic scrapbooking border secured to the boots with paper fasteners. To match Misty’s boot piping, I used copper puffy paint. Before the next wearing, I need to add elastic to the the leg opening, stitch down the slack at the front of the ankle, add the rest of the heel piping, and replace the [aluminum foil] with cuff bracelets or something comparable from the hardware store. I love, love, love this costume. Despite the challenges, nothing fell apart and I didn’t feel exposed. For a small, first year con, this was perfect. Also, I learned a little about working with spandex, which is a special animal. Now, if I can just get the Husband to be my Iron Fist, the costume will be complete!